Westmark Construction places a high degree of importance on incorporating energy efficient products and practices into our projects. This is something we have been passionate about for years! For even more tips of things you can do around your home, check out this list of 10 things you can do to build green, and these 21 innovative things to do around your house to go green! Some of the work we have been a part of in the past, such as the Townhomes at the Ridge, embraced natural lighting, efficient appliances, and minimizing the impact on the surrounding environment to create beautiful and sustainable homes. This particular development earned Built Green Gold Status, recognizing the efforts put in to building environmentally friendly homes. It is crucial that we begin finding ways to address energy consumption and related emissions as the battle against climate change becomes more urgent. At the end of September, the province of BC introduced a program, EfficiencyBC, that provides incentives, rebates, and offers to people constructing or renovating who include high-efficiency materials, appliances, and systems in their project. This program applies to both residential and commercial construction and renovation projects. Energy efficiency is one of the most important aspects of some people’s renovation or construction plans. There are countless reasons why, such as reducing energy costs to save money in the long-term or reducing energy consumption to match a green lifestyle. But, with new rebates available for people building or renovating, there is even more incentive to incorporate energy efficient appliances, systems, and materials into your projects! It can be overwhelming finding a place to start with this, since there are countless options and projects to consider. For example, you could replace appliances or windows, work on insulation and sealing, or install a more efficient temperature control system. One great place to start can be getting a home evaluation from an EnerGuide adviser. This evaluation will help you develop a plan of action for your energy efficient custom home renovations by going through your home or construction plans to provide details and suggestions for what you can do that is tailored to you, your home, and your budget. If you are building or designing your own custom home, getting an evaluation can help ensure you integrate energy efficiency into the project. An important consideration is to remember that the incentives, rebates, and offers provided by the program can help offset the costs of the project! Additionally, energy efficient upgrades do not necessarily have to be major renovations or projects. Even small DIY projects such as fixing leaky faucets and using solar-powered and motion activated lights in your yard can contribute towards a more efficient home. Under the Better Buildings BC Program, multifamily and commercial renovation and construction projects can receive rebates for energy efficient construction. It is extremely important for these types of buildings to include efficient and sustainable materials and upgrades because this sector consumes more energy and produces more emissions. Including, for example, high-efficiency heating and insulation in a large apartment building can equate to massive savings in energy costs and emissions produced for a large quantity of people. It can also help increase the value of the property to buyers and of the units for renters. 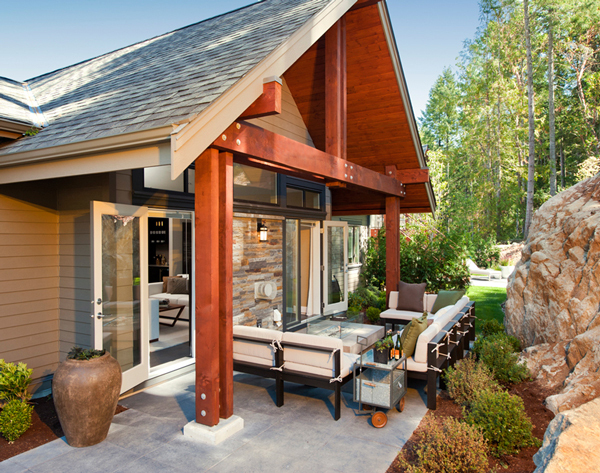 For more information on where and how to begin working towards a more energy efficient building, visit Efficiency BC to see all the different rebates and options you have while conducting a custom home build or renovation, or a commercial build or renovation. Looking for someone to help lead your construction project and want it to be energy efficient? Contact us today! When you are working with your construction project manager, make sure to mention your interest in energy efficient and environmentally friendly construction and we can make it happen! Have a Project in Planning? Let's Chat! Check out our Custom Home Portfolio!